The Nut-Free Mom Blog: Food Allergy Treats: Two Nut-Free Granola Bar Recipes! 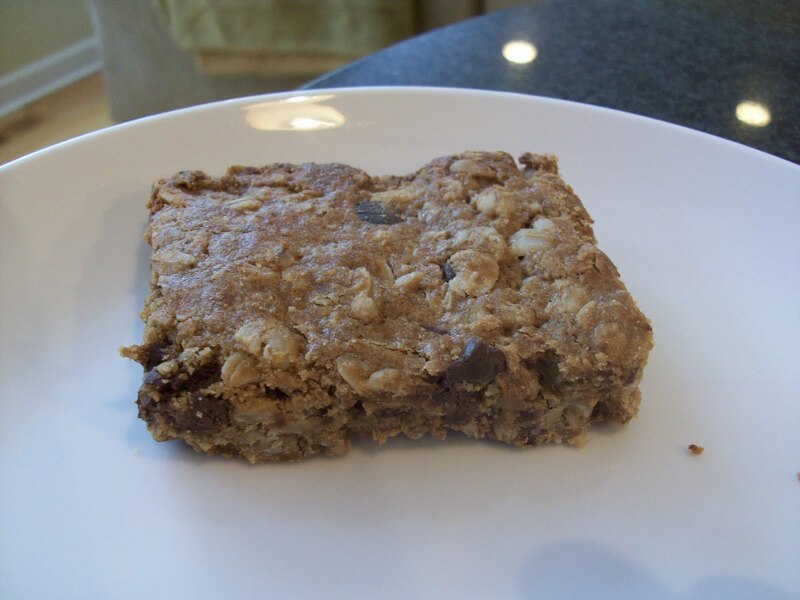 Food Allergy Treats: Two Nut-Free Granola Bar Recipes! Some of the most difficult products to find are nut-free granola bars, which is too bad because they make great, relatively healthy snacks for kids and adults. With that in mind, here are two nut-free granola bar recipes for you to try. The first is my own creation and the second granola bar (nut-free, egg-free AND dairy-free) is generously shared by Lori Sandler of Divvies! If you don't know about Divvies, you should! Lori creates amazing nut-free, egg-free, dairy-free baked treats as well as candy and baking ingredients. The recipe is from her recently released nut-free, egg-free, dairy-free cookbook: "The Divvies Bakery Cookbook." A word about chocolate chips: both of the following recipes use them. If you want nut-free chocolate chips only, then check out Vermont Nut Free Chocolate for delicious varieties. If you would like egg-free, dairy-free and nut-free chips, Divvies and Enjoy Life Foods sell them. OK, first off (the bar pictured above) is my granola bar recipe. These are easy to make and I was truly pleased with the result. They tasted a lot like store-bought, only better. :) I guess I was a little too pleased with them, because between me and my family, they have already disappeared! - Preheat oven to 350 degrees. Spray a 9 x 13 inch pan with Pam. - In a large bowl with a wooden spoon, mix oats, flour, brown sugar, chocolate chips, wheat germ or wheat flour and salt until blended. Stir in oil, honey, SunButter, egg or applesauce and vanilla until thoroughly combined. Pat mixture into pan with a wet hand (so you won't stick too much). - Bake until golden around the edges, 30 to 35 minutes. Cool completely in pan on wire rack. - When cool, cut lengthwise into bars of your preferred size. I did four strips, each into four pieces for a total of 16 bars. For those of you looking for a nut-free, egg-free and dairy-free variation (or just a different, delicious taste) here is Lori Sandler's recipe from The Divvies Bakery Cookbook. Thank you, Lori! These look and taste great! I love the addition of the shredded wheat cereal and dried fruit. Lori suggests this as a topping on dairy-free "ice cream," on its own as cereal or mixed into oatmeal. Yum! 2 cups shredded wheat, torn by hand into threads, not dust! 3. Combine the oats, shredded wheat or puffed rice, brown sugar and salt in a large mixing bowl. Transfer the mixture onto two lined baking sheets. 4. Bake the granola for at least 20 minutes, stirring occasionally and watching carefully so it does not burn. Rotate the pans on the racks for even heat distribution. Remove the granola from the oven when caramel in color. 5. While the granola is baking, pour the honey or agave nectar into a small saucepan and place over medium heat for 1 to 2 minutes until boiling. Turn off the heat. 6. Add the margarine to the honey and stir until completely melted. 7. Once the granola has baked, pour it into a large metal bowl and add the dried fruit. Keep the oven on. 8. Slowly pour the hot honey mixture over the granola. Mix with a spoon (that has been sprayed with non-stick cooking spray) until well coated. 9. Add the sunflower of soy nut butter and mix with the coated spoon until the hot ingredients melt the sunflower seed butter. 10. Pour all the ingredients back onto one of the parchment-lined baking sheets. Place a fresh piece of parchment paper on top of the warm granola bar mixture, then light press the mixture with the heel of your hand, pressing it into a 12 x 6 inch rectangle. 11. Remove the top layer of parchment paper, and place the baking sheet back into the oven. Bake for 20 minutes, rotating the baking sheet twice. 12. Remove the granola bars from the oven and gently press chocolate chips evenly into the top. Let sit for 15 minutes, then cut int thirty-six 3 x 2 inch bars while still partially warm. Makes 3 dozen 2 x 1 inch granola bars. SUPER excited to try these!!! thank you for sharing! Thank you so much for posting these. My son has a peanut allergy but loves granola bars. Glad to know I make them myself now and know exactly what's going into them! I might actually try this, no coconut we haven't had anything "granola" in a very long time. Thank You! Thanks for the recipes Jenny. One question, what brand of wheat germ do you use? I've had a hard time finding one that is made in a peanut/tree nut free facility. I've always used the Kretschmer (spelling?? ):) wheat germ you can find at most grocery stores. Quaker owns that brand and will mark for cross-contact/food allergens. I use their oats, for example, and I feel confident using it. However, I understand the desire for a 100% nut-free facility. You may want to search www.peanutfreeplanet.com. They have so many products that are made in nut-free facilities because they sell Canadian version of many US brands--and they tend to have more nut-free practices. If you want to skip the wheat germ, you can substitute with whole wheat flour. I have tried it this way and it was still good. Hope this helps! OO thank you! I can't wait to try these!